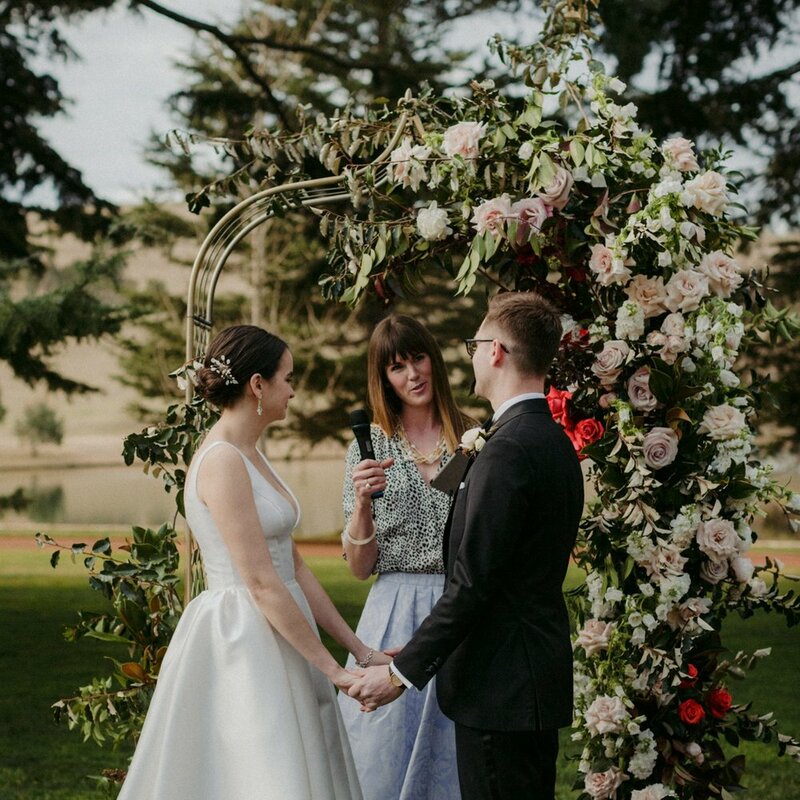 Alexandra Weddings is a boutique marriage celebrant service in Sydney and the Southern Highlands of NSW, run by Alexandra Lollback, an energetic and open-minded young marriage celebrant who understands couples want their wedding to truly reflect their personalities both as individuals and as a couple. Wow! We can’t say enough wonderful things about Alex. Alex made our ceremony truly unique and all about our story - from our first meeting and what we loved about each other to what we wanted our lives to be together. She took the time to get to know us as individuals and as a couple; having calls with us at odd hours to accommodate the time difference between Sydney and London. She knew us so well, that a few weeks before our wedding she sent us the trailer for a film she thought we’d love - and she was right! Alex was really focused on the ceremony reflecting who we were as a couple, rather than what a ceremony is expected to be. The ceremony flowed naturally and told a lot of our funny stories. It made our guests laugh along with us and remember the stories they were a part of. This was really important to us because every person at our wedding contributed in some way to our relationship, so it was almost like a way for us to acknowledge each individual and let them know how important they are to us. My husband and I decided to keep our vows secret until the ceremony. Alex was fantastic at guiding us through the vow writing process to ensure that our vows were of a similar length and tone, while also not revealing what each other had written. Alex was prepared and professional on the day, she was more than on-time and spoke beautifully. In fact we chose Alex because of her background in radio and the fact that she has a beautiful speaking voice - hilariously on the day she was recovering from having lost her voice a few days earlier, which meant she had this brilliant husky quality to her voice and it sounded even better! 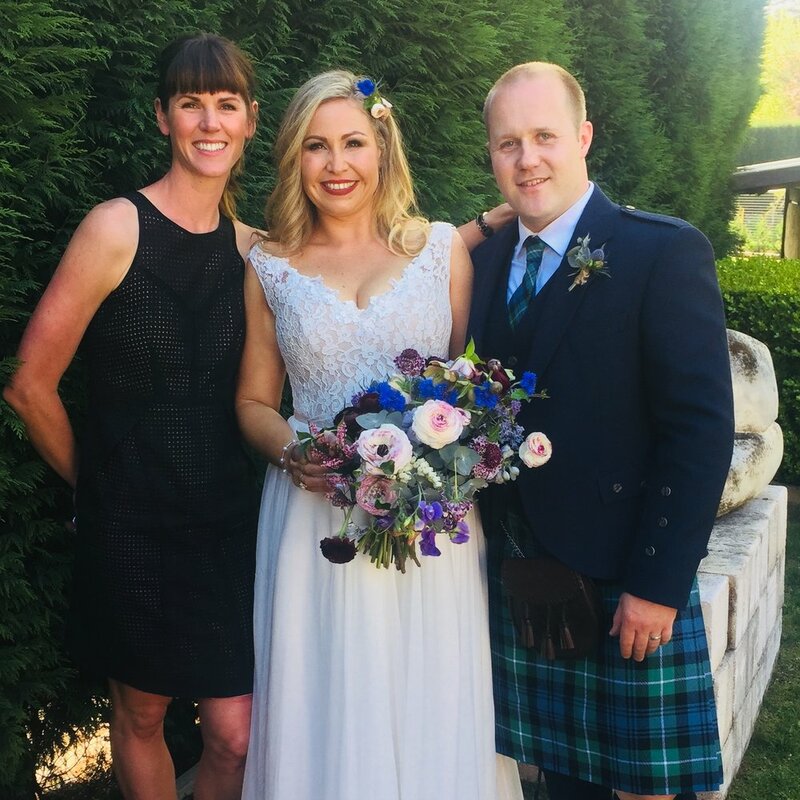 We’ve had so many of our friends and family say how thoughtful and fun the ceremony was, how it was “very us”, and just how fantastic our celebrant was. Our ceremony was everything we wanted it to be and we can’t thank Alex enough. Alex you did the best job with our Wedding ceremony. We were in search of someone fun, modern & personal to make our ceremony memorable. From our first meeting we knew you were "the one." You most certainly exceeded all of our expectations. You prepared us for everything, from choosing the ceremony style, explaining how the day will flow & what to expect, down to calming our nerves & most importantly, making sure the boys were in the right place! Our ceremony had a really fun vibe, & you were so engaging! We received our Marriage certificate within only days of the Wedding & the service couldn't have been more efficient. Thank-you for making our day so special. We are so happy to have chosen Alex to be our celebrant. One of the comments we continued to receive was how great the ceremony was. People just loved how the flow of the ceremony was, how you kept it light but interesting and made people feel a part of our relationship. You welcomed everyone in with a warm and friendly heartfelt ceremony. Our families are quite accustomed to church ceremonies and all of them loved it! You helped make our day such an amazing one to remember. Thank you!! Alex is an excellent celebrant who made us both feel comfortable throughout the whole process. Her personalised touches to the ceremony document make it extra special and her guidance was always spot on. We had tons of people commenting on how wonderful the ceremony was because of the celebrant. Alex is so easy to talk to and we found an immediate rapport with. The vows were spot on for us and gave lots of lovely touches that we would have never thought of. We could not recommend her enough! The ceremony was absolutely perfect. It was spot on as far as really reflecting us and set the scene for what was the perfect day. 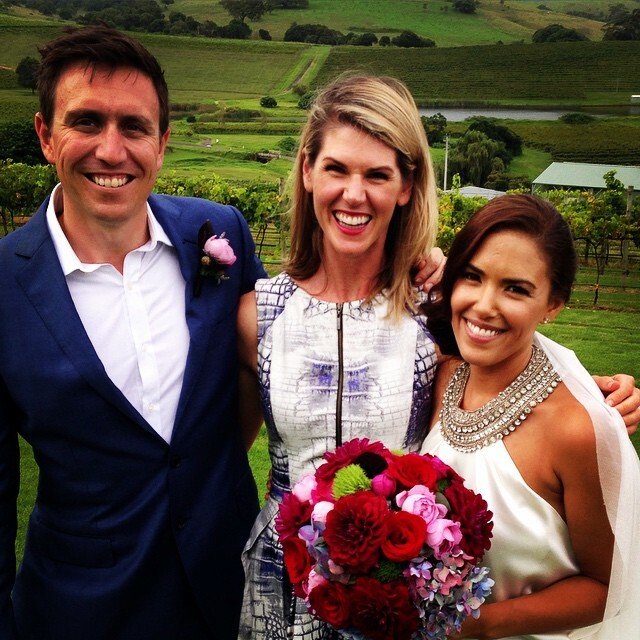 Thank you Alex for being a total legend - we were so happy to have you officiate on our wedding day. It was a pleasure getting to know you because you are legit a really cool chick, and you absolutely lived up to our friend's recommendation that led us to your door. It was the personal things that really made this a lovely experience - you took the time to get to know us, you stood off to the side on the day even though in that gorgeous dress we would have been happy to have you in all our photos anyway, you were always on the ball and you made us feel super comfortable. Would do it all again just the same and we would happily recommend you to anyone who wants a top notch celebrant!! Alex, the ceremony and service were completely amazing. In all the weddings we've been to, we've never actually seen a celebrant who we've thought was really great - there are a lot of middle aged, cream suit-wearing, mushy love poem-reading, boring preachy celebrants, with websites with patterned pink background and cursive script saying "Your Special Moment". It generally makes us want to vomit. Alex you were SO DIFFERENT!! Right from the first meeting we knew we were in good hands. The ceremony you prepared for us was fun, meaningful, unique, full of energy and delivered so perfectly! 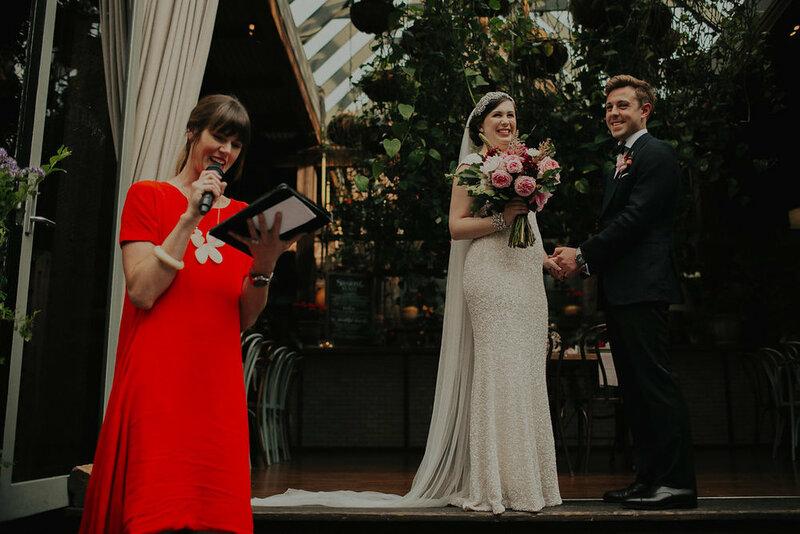 You're a natural public speaker, with the poise and confidence that gave our ceremony the sense of occasion it deserved, while keeping it so beautifully light and informal at the same time. We have had so many comments and are so thrilled to be able to pass on your details to our engaged friends :) Thank you thank you thank you!! We're going to miss our meetings! Maybe some vow renewals will be needed. Thank you so much for making our day so special. It really was a wonderful celebration and couldn’t have happened without all the support from friends & family, including yourself! We hope you enjoyed the ceremony. It was everything we could have asked for, and more. We cannot thank you enough for all your help and sharing such a special day with us. The ceremony was perfect and exactly what we wanted. Everyone said how lovely you seemed and really set the tone for the ceremony. We were also thrilled that the bridesmaids made it down the steep path to the garden in one piece. We had such a great night too the band was incredible, great speeches, food and endless dancing!!!! Jarrod and I would like to thank you for helping us to realise our perfect wedding day. You are a true professional, carrying our your role seamlessly. You made us feel immediately comfortable by showing genuine interest and sharing in our enthusiasm for our day. Your ceremony perfectly set the relaxed and joyful tone of the entire evening - your happy face was a great introduction for our guests. Alex, you are everything we were looking for in a celebrant - calm, collected, good for a laugh and approachable. A delight. Alex explained things thoroughly so there was no need for a lot of email/phone communication but she was really quick to respond to the little email/phone communication that we did have. She was lovely and warm in person, and made us both feel very comfortable during the ceremony. Would highly recommend her to anyone getting married. We loved the vows Alex wrote for us. We initially thought that we would want to write our own vows but after reading the vows and ceremony that Alex had prepared based on information from us, we were more than happy to go with those. Alex understood that we wanted a relaxed, casual and fun ceremony and we got exactly that. Thanks so much Alex. You made our ceremony exactly what we wanted and at a time when we were both pretty nervous, you made things easy, fun and light-hearted. Thank you so much for being part of the day. Everybody has raved about the ceremony and so many people commented you are the best celebrant they've witnessed at a wedding. So pretty great reviews for you!! You just struck the perfect tone because the venue and how the room was set up was pretty grand but we still wanted it to be fun, relaxed, intimate and loving. You helped set up that feel, right from the beginning!!!! So thank you. Thank you Alex once again for being our celebrant and for making our day so special. From our first meeting all the way through to the day your service, attention to detail and all your help was outstanding. Alex, I can't tell you how many comments I've had about how wonderful our celebrant was! You were such a hit! Your delivery was just superb. You were beautifully presented. Your story-telling was warm, funny and engaging. We, and all of our guests, loved your relaxed yet professional style. You took the time to pull together a ceremony that reflected us perfectly. We couldn't have been happier to have you there. Thank you so very much. Alex, a huge THANK YOU to you for doing such an awesome job on the day. Thank you for being so supportive, and such a trooper, carrying on with such a wonderful ceremony that we, and all of our guests enjoyed so much, even with a bit of drizzle! Alex and I would like to take this opportunity to thank you for everything you have done for us. Our ceremony was just incredible, so personal and loving! We find it hard to describe just how happy we felt at the time, and how grateful we are to have you help us to create beautiful memories we will never forget. You were an absolute blessing to work with, taking all of our questions and concerns on board and supporting us through everything. All of our guests were raving about our ceremony and how perfect a "fairy tale" it was. Thank you so so much Alex for totally making our ceremony what it was. From the first draft we both had tears in our eyes, not sure how you managed to absolutely nail the script & capture our personalities in their entirety, but you did it somehow & this is what made the service for us, it was US. I could not recommend Alex highly enough to any one who is looking to get married soon, I think that everyone that attended our ceremony will be either using Alex or recommending her on as her vibe set the scene & the ceremony was so happy - it was a common comment afterwards. Thank you again for helping to make our day perfect. From the get-go you were all over it and understood our personalities completely. You nailed the ceremony and its words and my wife and I (as well as our guests) agree that the ceremony couldn't have gone any better, and that it was very 'us'. Thanks again Alex for all your wonderful help and guidance for our ceremony. We had a great evening and everyone couldnt stop complementing how great you were before and during the ceremony. Someone told me you had your hens night that night - I hope you had lots of fun and weren't held up too much with that bloody ferry! We will continue to recommend you to our friends and family. Well that day was pretty well perfect for us. Thank you so much for all of your help in the lead up to, and on our wedding day! We couldn't be happier with how everything went. The ceremony was fun and relaxed, and we felt like it really reflected us as a couple and was exactly how we both imagined our wedding to be. We can't thank you enough for being a part of our day and for helping to make everything run so smoothly! Everyone has commented on how great you were, and a few of my engaged friends have already asked for your details! It is hard for me to appropriately articulate the deep level of appreciation and gratitude I have for Alex and her involvement in the solemnisation of our marriage. She was recommended to us by a “friend who heard about her from another friend”. When we met she was so forthcoming and warm. So much so that Nick, my notoriously quiet and shy husband, spoke so freely in our meetings I knew we had to book her in! Alex’s professionalism and knowledge was evident in all of her work. We were so unsure about the type of ceremony we wanted so we left it completely in her hands. The ceremony was so heartfelt and thoughtful we could not have planned it better. When I read the vows for the first time I shed a tear. She was on top of the all the paperwork and the legal timelines which meant that in all the chaos we knew we were being steered in the right direction. On top of this she managed to coordinate (and tolerate) our all male Bridal party who can be cheeky devils at best; possibly one of the biggest pre-wedding challenges, which she navigated with humour and composure. Then came the actual wedding day. Intermittent showers and a consistently wavering forecast meant certain uncertainty for our outdoor ceremony. The back-up plan was abandoned at risk and, as light rain fell from the grey-blue skies, Alex was there to reassure the Groom and guests that the plan will go ahead. And although the eventual break in the weather perhaps cannot be attributed to Alex, she was there to direct the show and ensure that all involved were comfortable and happy. Our wedding ceremony was the most perfect start to what was the most memorable day for Nick and me. Thank you Alex so much for being such an integral part of our special day. After ten years together it was hard to imagine our wedding being much more than a piece of paper and big party. You ensured that it was warm, funny and full of love. We will look back on our wedding ceremony with fond memories of our bro-maids, groomsmen, Little Bronx in his tux, the spectacular views and our beautiful, poised, articulate celebrant who made us husband and wife. Alex, thank you so much for allowing us to stay true to ourselves and providing us with an amazing wedding ceremony that we both absolutely loved! Every word you crafted was personal and beautiful - it felt that you understood us as a couple after only meeting us once or twice. The relaxed and fun vibe of our ceremony was exactly what we were looking for and you certainly delivered it! Our guests all commented on how cool, calm and collected you were, as well as being extremely professional with your delivery. Throwing in your little bits of humour throughout the ceremony was really fun too! You were a pleasure to have as part of our special day.. we honestly wouldn't have wanted anyone else. Thank you again! Thanks so much Alex, we had a great experience from the first meeting with you to the ceremony/vows you wrote for us to the big day - helping to make it perfect! We've already recommended you to our friends. Having attended a wedding where Alexandra was the celebrant, I was extraordinarily impressed by the dignity, simplicity and the relevance of the ceremony over which she presided. It was as if Alexandra was having a conversation with the bride and groom and with all of us. Put simply, it was the best I’ve ever encountered. Alex, you did a wonderful job, it added enormously to the day. We had the most amazing day and you were such an integral part! You helped create so much love, laughter and of course tears throughout our ceremony. We would not have changed a thing! From our first meeting with you we knew you were the "celebrant" for us. Your bubbly, friendly personality made the whole process a breeze. We knew we could come to you with just about anything and you were always willing to help and provide your advice. We had so many friends and family who commented on what a beautiful ceremony you had prepared and how you captured our personalities, beliefs and values throughout the entire service. We had an awesome wedding and that all began with the fantastic ceremony that you put together and delivered for us. From the time we enquired with you, we felt comfortable with your modern and considered approach to our needs and tailoring the ceremony to suit that. All our guests commented on how refreshing it was not to hear the same old ceremony that has been done for years. Thank you again and we will certainly be passing your details onto friends being married in the future. Everything was perfect! I am so happy that you were a part of our wedding. Email communication was always prompt and clear, probably the best of all our wedding vendors! I also have to say the rehearsal was wonderful – Alex you were so calm so made me feel confident that it was all going to be ok even though I was starting to freak out a bit about the wedding in general. We've had lots of compliments about you and we have already recommended you to our friends. Thank you so much - everyone at the reception commented on how amazing the ceremony was - the phrase "best ever" was used again and again. Alex, you really helped make our day special and made the whole process a pleasant experience. The preparation and our catch-ups in the lead-up were seamless and it felt like you really and truly understood us. We can't thank you enough! Thank you so much Alex, you were AWESOME! Everything you did for us was perfect, we wouldn’t have changed a thing and we are so happy that we found you to be our celebrant. You were very friendly and approachable and made chatting to you very easy. We felt so comfortable knowing that you had done many weddings previous to ours and you knew exactly what needed to be done. We absolutely LOVED the vows, they were perfect. So many friends and family also commented on what a lovely ceremony it was, loving the way the ceremony was structured and the vows were simple but beautiful. We will definitely be recommending you to our friends in the future when they’re looking for a celebrant. Dawn + Rami from high tea films on Vimeo. We knew from the moment we met you that we wanted you to be our celebrant, at our first meeting we built an instant rapport with you and as soon as you walked out the door we looked at each other and said “she’s the one” haha. Your approach was fantastic, you seemed generally interested in our story and the fact that you had started asking questions and taking notes on our relationship before we’d even officially given you the job was very impressive. Your ceremony captured the essence of our relationship so well and it was as beautiful and memorable as we had imagined. We chose not to write our own vows and the ones you wrote for us were beautiful, heartfelt and emotional while being unique and special. I think my above comments pretty much sum up how much we LOVED your work. 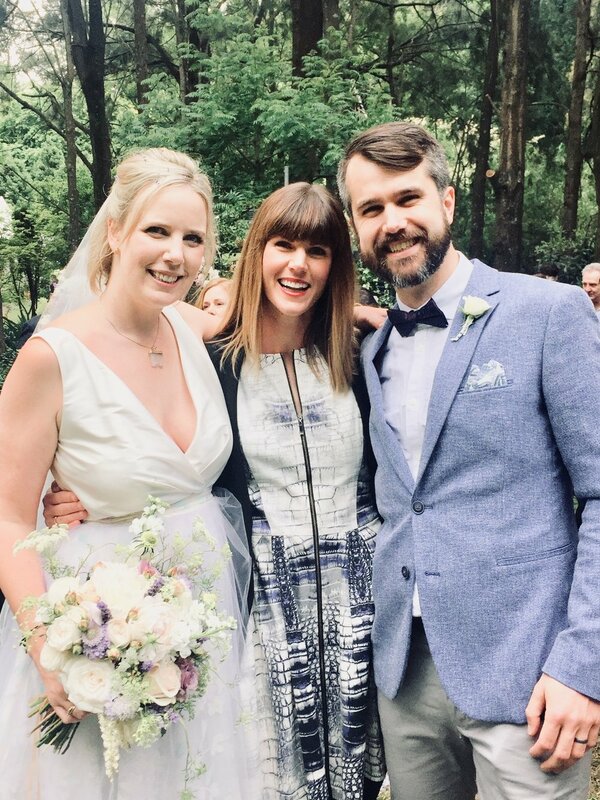 We are so happy we found you to be our celebrant, we found a connection with you from the start, which made us even more excited about our wedding ceremony. Your approach was relaxed yet professional, you always had things under control and your personalised service made us extremely satisfied and confident in what our wedding day would be. You are an absolutely brilliant celebrant and if you’re still doing this in 20 years, we’ll have to call you to renew our vows! We were so happy with your contact in the lead up to the wedding, the ceremony you prepared and how open you were to changes of our choosing. On the day you were perfect and all our friends remarked on how you were easily the coolest celebrant they'd ever seen. We will happily recommend you to all our friends however we probably won't need to as you made fans out of everybody who attended our wedding! Alex, we could not be more pleased with the ceremony. You went above and beyond on the day and were a welcome guest, not just the celebrant. We received many really positive comments about your service – your warmth, kindness and communication. We felt relaxed and comfortable with you from the very beginning and will recommend you to everyone. Thank you for making our day absolutely perfect and thanks also for helping with the last minute set up!